For years, residential and landscape architects have recommended that rainwater be whisked away from our homes as expediently as possible. Consequently, most of our homes come equipped with drainage systems that include rooftop gutters and impervious concrete driveways and patios that divert thousands of gallons of rainwater into PVC pipes. From there it sloshes its way through our streets, dumps into storm drains and creeks, and gushes into the bay. That keeps our homes dry, but it has environmental consequences, including increased water pollution, accelerated erosion and warmer temperatures in our waterways. And as everyone who pays a water bill knows, water is a valuable commodity that should be conserved and retained. Gravel paths allow rain to slow, spread, and sink. To alleviate these problems, today's landscape architects and environmentalists design drainage systems that include strategically located berms, swales and rain gardens, as well as water-permeable surfaces that let rainwater slowly infiltrate the ground rather than being diverted to pipes. The goal is threefold: create systems in which rainwater flows are slowed, spread out and allowed to sink into the ground. Berms and swales: Contouring the ground allows rainwater to be channeled and captured on site. By digging out trenches of varying lengths and depths and "berming up" the edges, rainwater can be moved from high points to low points where it can slow, spread and sink. Some gardeners choose to celebrate the beauty of their swales by creating seasonal ponds. 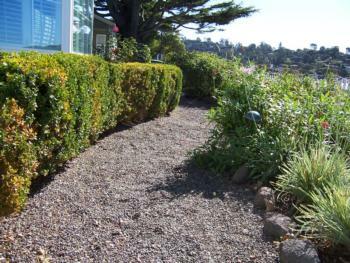 Placing rocks and boulders around the edges to hold the soil is not only functional, but attractive. Rain gardens: Building a rain garden in your own yard is probably the easiest and most cost-efficient thing you can do to reduce your contribution to stormwater pollution. Designs can be any shape or size, employing a variety of trees, shrubs, flowers and other plants that are adaptable to both wet and dry conditions. Beneath the plants, layers of mulch, soil and sometimes gravel catch excess water and slowly disperse it through the ground and back into the water table. Rain gardens can be formal or informal, include wildflowers and ornamental grasses, and incorporate pathways and other landscape elements. They can be built by hand and have the potential to save thousands of gallons of water. The University of Wisconsin-Extension has produced an illustrated rain garden how-to manual for homeowners. Permeable surfaces: Next time you are planning a new path, patio or driveway, consider using a permeable surface that allows water to seep through it or around it. Gravel and mulch are obvious examples, but stone, pavers and concrete can be permeable, too, so long as there are crevices where water can percolate. There has been an explosion of permeable materials on the market, including porous cement concrete, porous asphalt concrete, and pavers that are specially designed to allow water to flow through. Stop by your local landscape supplier for samples. Some carry high price tags, but don't be daunted. Old broken-up concrete and bricks, floor tiles and pieces of wood can be suitable, too, provided there are spaces where water can soak in between. Next time there’s a heavy rainstorm, don your rain gear and head outdoors. Make a thorough survey of where the water is flowing and pooling. Even small changes in your landscape can make a big difference in reducing runoff and keeping precious rainwater on your property.